The National Association of Social Workers Communications Network Advisory Committee. Top row from left: Sherry Amatenstein, George Anderson and Matt Anderson. Second row from left: Matt Conn, Kirstin Downey and Suzanne Dworak-Peck. 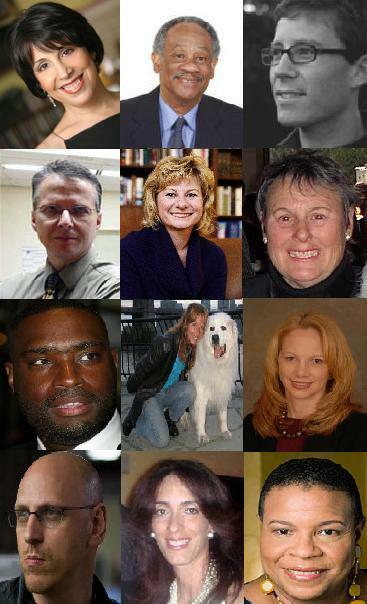 Third row from left: Antwone Fisher, Kathy Gurland and Jenna Mehnert. Bottom row from left: Oren Moverman, Maribel Quiala and Terrie Williams. Not pictured: Ellen Rostand. The National Association of Social Workers is announcing it has formed an advisory committee of Hollywood writers, award-winning journalists, social workers involved in the media and others to educate the public about social workers and increase awareness of the profession. The NASW Communications Network (NCN) Advisory Committee members include author and Pulitzer-winning Washington Post reporter Kirstin Downey; Academy Award-nominated director and screenwriter Oren Moverman; social worker, anger management expert and movie consultant George Anderson; author and screenwriter Antwone Fisher; and social worker, author and national columnist Sherry Amatenstein. The NCN Advisory Committee will identify ways to promote social work roles in television and film, position more social workers as consumer education experts, inform public policy debates with social work research, and increase interest among youth about the social work profession. Sherry Amatenstein, MSW, LMSW: Social worker, author, columnist and talk show guest. George Anderson, MSW: Social worker, anger management firm owner and movie consultant. Matt Anderson, MSW: Social worker and documentary film producer. Matt Conn: Communications director at the University of Maryland Baltimore School of Social Work and university admissions expert. Kirsten Downey: Author, award-winning journalist and former Washington Post reporter. Suzanne Dworak-Peck, MSW: Past president of NASW and International Federation of Social Workers, NASW Communications Network founder. Antwone Fisher: Author of “Antwone Fisher,” Hollywood screenwriter and former foster child. Kathy Gurland, MSW: Social worker, founder of “Peg’s Group” cancer consulting service, national columnist and former actress. Jenna Mehnert, MSW: Social worker, NASW-Pennsylvania executive and former political staffer. Oren Moverman: Oscar-nominated movie director, screenwriter and former reporter. Maribel Quiala, MSW, LCSW: Social worker, women’s health and Latina issues media expert. Ellen Rostand, MBA: Assistant dean of communications, Brown School of Social Work, Washington University. Former health care communications executive. Terrie Williams, MSW: Social worker, author, PR firm and Stay Strong Foundation founder. NASW’s new media advisory committee builds upon the work of NASW Past President Suzanne Dworak-Peck, who founded NCN in the early 1990s. Part of the NCN’s activities include acting as a Hollywood referral source. NCN has now been incorporated into the multi-year National Social Work Public Education Campaign, which is made possible by donations made to the NASW Foundation. It’s a great moment to educate and thus enlighten the public about what this profession is all about. Social workers are like the “Cinderella” of the health professions. We support and do the “dirty work” for our “sister” mental health practioners. I’d be interested in contributing to the effort as well. Thank goodness. It’s about time. Let me know if I can help. This is a great idea and the fact that it is in process is even better. The more we can promote the field of social work and show the professionalism behind the “real work”, the more our work will be recognized for what it is. Social Work is an invaluable profession and needs to be treated as such. But, it can’t be that until we as social workers hold it to the standard we expect others to hold it to. This effort by National NASW will be the beginning of a transformation in what people understand social work to be. Thank you!!! I would love to get involved in this committee. Indeed, social work is an extremely undervalued profession. I am glad the NASW is taking steps to improve out image and help us earn the respect we deserve! Again, what a way to advance the profession. I believe the best and only individuals that can speak about the profession, are “Social Workers”!! I am proud to have the chance to help advance the incredible profession of Social Work.